Happier Than A Pig In Mud: Happy Easter! and bunny ears are big. Hopping by to wish you a beautiful Easter! And from my home to yours-Happy Easter everyone! Heehee, I hope you don't get banned either but how could she, he's so cute! Happy Easter to you & yours too! hehe! Have a blessed Easter! I think we'll both be banned together! But at least you remembered to count your words! I'm REALLY up for detention! Blessed day for us all. Your card made me smile, and Linda's comment made me laugh! I don't think you'll get in too much trouble. Just blame it on Earl. Where's Earl? Happy Easter Lynn!! Hahahahahahahahahahahahahaha! Very appropriate comeing from YOU, Lynne! This looks like he is safe from the Easter ham platter! The pig says it well! A very Happy Easter to you and your family, Lynn! That was just adorable...loved it and hope you and yours have a great Easter !!! Earl is showing his feminine side. So utterly cute. Gotta love it. Hope you have an oinking good Easter! Very cute! I saw a kitty in the newspaper with bunny ears. She looked absolutely thrilled - NOT - to be posing as the Easter bunny. Have a nice Easter! Don't worry Lynn. If you get banned, at least your old buddy Earl will be thrilled with the card! Tell him to start a Pig-a-thon to get you reinstated in the club! I hope you have a very happy and blessed Easter. No bunny could be cuter. And happy Easter to you. Very Hallmark. Love the pig! This little piggie is so darn cute! oh my, what a fun. Its too cute. Happy Easter to you. Soo cute. Happy Easter Lynn! Loving the blog! Happy Easter! OMG! 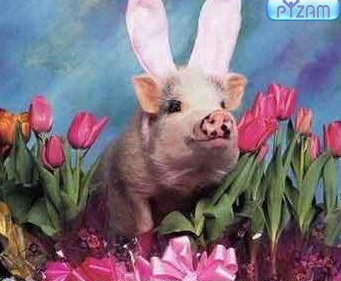 It's the Easter Piggy! Well, I"M a believer now!!! LOL! Well done! The Easter piggy does sound a bit yummier than the Easter doggie anyday! You are hilarious! Loved this!